Completed 2007. When this customer was looking for the ‘finishing touch’ to the library of his new designer house near Lincoln, Nebraska, he asked if we could come up with a design for the room’s French doors that showed his plane, a Great Lakes 2T, in a mode that suggested — flight. 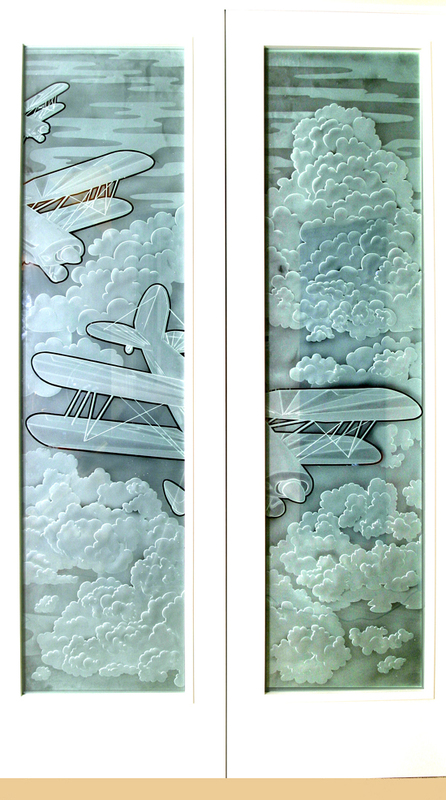 Here is the finished composition, titled ‘Images of Flight!” Sand-carved glass, to bring out detail, while being compatible with the decor theme of the home design.